The last note of the organ lingered like the cloud incense in the air. I knelt for a quick thanksgiving as parishioners gathered their things and began to leave the pews at the end of the Sunday Mass. Then there was a gentle tap on my shoulder. “Excuse me,” the woman behind me spoke. “We were just passing through and happened to stop for this Mass.” She paused, and asked in a hushed, awed tone, “I just wondered, is the music here always like this?” I nodded, understanding her meaning completely. The sacred music at our parish’s High Sunday Mass was breathtaking. My fellow worshipper shook her head in amazement. “We have been blessed,” she said emphatically, obviously deeply moved. At our daughter’s First Holy Communion Mass last Spring, her godparents and their family made the long drive across town to be present for her big day, filing into the pew behind us just as the glorious processional hymn began. As the Mass ended, I turned to embrace her godmother, my friend Anne. Anne had the same look of amazement on her face. “I feel like we’ve just been in heaven,” she whispered to me. It was true. And appropriately so: “In the earthly liturgy we share in a foretaste of that heavenly liturgy which is celebrated in the Holy City of Jerusalem toward which we journey as pilgrims, where Christ is sitting at the right hand of God, Minister of the Sanctuary and of the true tabernacle. With all the warriors of the heavenly army we sing a hymn of glory to the Lord…” (CCC 1090) and, because in some places this is less obviously so, a good reminder not to take beautiful liturgy for granted. 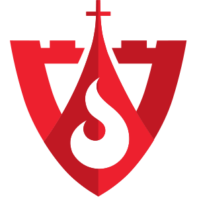 We had joined this parish, St. Thomas the Apostle in Phoenix, years ago for three reasons: truth – sometimes challenging truth – in the homilies, a vibrant community, and not least of all, beauty in its worship. The celebration of the Eucharist, the center of the Church’s life and the highpoint of its worship, should be given a dignity and a grandeur worthy of the reality it makes present: Jesus Christ, King of the Universe, really and entirely present in our midst, descending to us and simultaneously offering Himself to the Father for us. The God of our salvation is suspended before us in a humble, translucent host, and we fall to our knees in awe and wonder. He has accomplished what we are utterly incapable of. We join our hearts to His in this most powerful sacrifice, all our little sufferings and trials taking on a significance they could never have on their own. It is a staggering thing, really, and it is fitting when the celebration of it elevates our minds and hearts to such realities, disposing us to the grace we are offered, and using all of our senses to lift us above the ordinary and the everyday: smoky incense, beautiful music, clear bells, flickering candles, reverent motions, rich responses. There is something deeply satisfying about it all, and something that not only connects us to heaven but to the wealth of the traditions of our Catholic history. For a brief moment, time blurs into eternity. The external forms of the Church’s prayer matter. We are not angels, but rather spiritual and material beings. What we do with our bodies, the physical environment we are in, the music we use, how we dress are all things that will have an impact on our interior dispositions and movements. Ritual is particularly important because it forms and teaches us on an unconscious level. It stands to reason, then, that when addressing the question of the direction of liturgical prayer, as with any liturgical question, we ought to ask what external forms best express and help us to understand the reality of the Mass and direct our interior actions most faithfully. The turning of the priest at Mass to face the people cannot be understood as reflecting a change in Liturgical or Eucharistic theology. The primary character of the Mass is not a meal, but a sacrifice. The Eucharistic Prayer is not a closed dialogue between the priest and the people, but rather a prayer offered by the people, through the hands of the priest. And this prayer, as all Christian prayer, is offered to the Father, through the Son, and in the Holy Spirit. These are the realities the Liturgy ought to express and, through its ritual forms and gestures help the people of God understand. It’s only one Mass a week. But already the attendance has seemed to swell, and I suspected that it would. There is a hunger for truth and beauty in the world, and there is a hunger for truth and beauty in our worship. I will continue happily and gratefully to attend other Masses ‘versus populum,’ that is, with the priest facing the people, and I am determined not to become so focused on the form of the worship that I lose sight of the Object of it – God Himself, who comes as promised no matter which way the priest stands. Still, I am grateful for holy priests who desire to attune us to the true meaning behind our worship and create an experience of beauty wherein to encounter Truth and Beauty Himself. Next up, I hope? Altar rails. “If I had the money, I’d put them back in,” our pastor admitted. Time to pass the collection basket! Photo of Mass at St. Thomas the Apostle Parish by Mindy Longwell, used with permission. 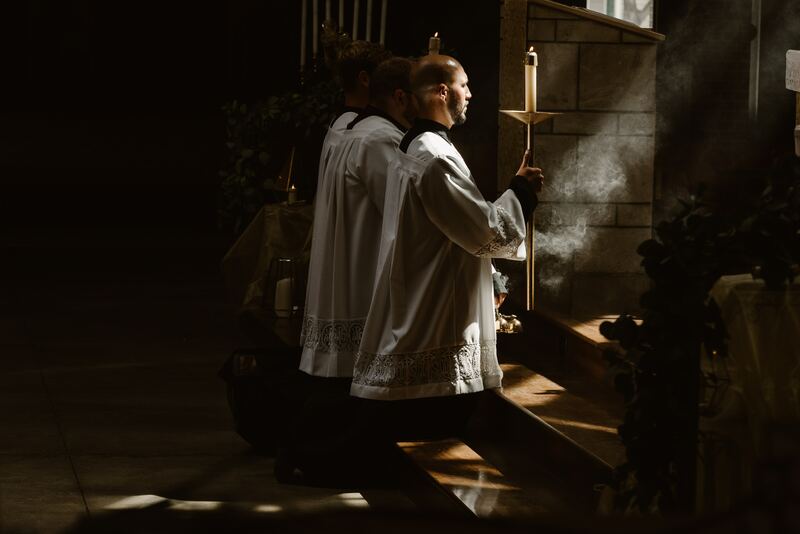 Photo of altar servers by Josh Applegate on Unsplash.